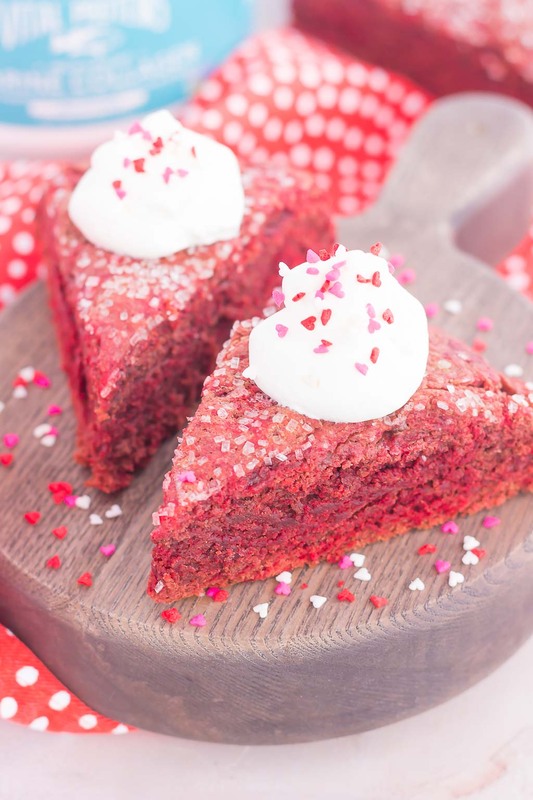 These Red Velvet Scones are crispy on the outside, tender on the inside, and bursting with a rich, chocolatey flavor. 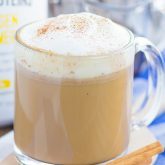 Topped with a sweet vanilla whipped cream, this decadent treat makes the most delicious breakfast or dessert! Today we’re talking about Valentine’s Day, again! You could all use another treat that’s filled with red and pink goodness, right? And just incase you need a last minute one, this will do just the trick! I feel like I say this every year, but holy moly, why does all of the Valentine’s Day goodies come out the day after Christmas?! I mean, can’t we at least enjoy the rest of the holiday season until after the new year? I know, I’m being a Scrooge, so I’ll stop now and get to the good stuff…food! Whether you like Valentine’s Day or not, it’s pretty hard to ignore the red and pink heart explosion that is going on everywhere. I’ve talked about this before, but I’m kind of neutral about this holiday. I don’t love it, but I don’t hate it…it’s just kinda there! The hubster and I used to go out for dinner to celebrate Valentine’s Day and our dating anniversary before we got married (which was February 5th, nine years ago!). And then we switched to ordering a heart-shaped pizza on Valentine’s Day! If you’ve been following along here or on Instagram for a while, then you might remember pictures of our heart-shaped pizza fails and successes over the years. I’m all about pizza, so I’ll take any excuse there is to order a heart-shaped one! And you can bet we’re ordering one tonight. I think it’ll be our 7th year doing this and it’s always a great (and casual way) to celebrate the day. If you want to see a piece of the pie, err heart, in action tonight, be sure to check out my Insta-stories! But what I also like are desserts. And even though I can’t take or leave Valentine’s Day in general, I do love any excuse to decorate with some pink and red fun! And that’s where these Red Velvet Scones come in. I’ve always been a fan of red velvet anything (remember these donuts? ), but it’s been a while since I’ve baked with this flavor. So, of course, it’s time to change that, friends! 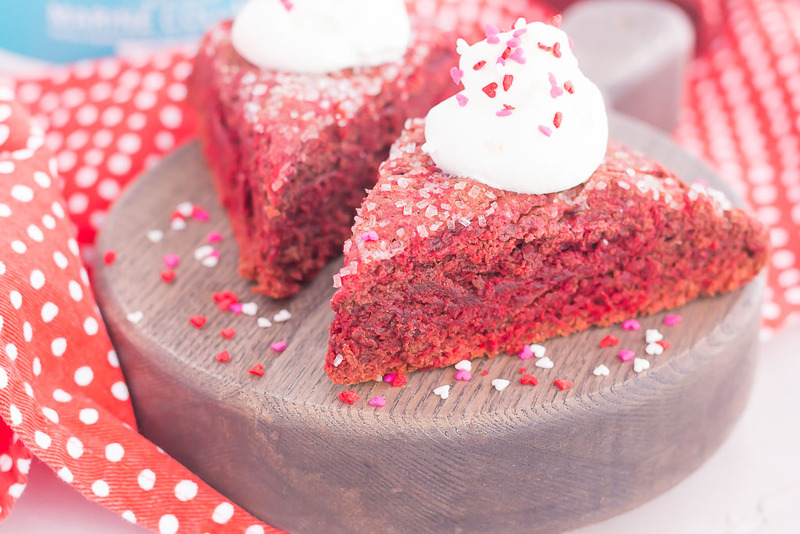 Valentine’s Day is the perfect opportunity for all of that red velvet yumminess, right? And do you know what makes these Red Velvet Scones extra special? Vital Proteins® Collagen Peptides! You may remember that I used it in these Pumpkin Pie Pops, that Spiced Gingerbread Latte, and those Strawberry Banana Baked Oatmeal Cups. It’s an unflavored protein powder that’s beneficial to your body in terms of improving your hair, skin, nails, joints and ligaments. 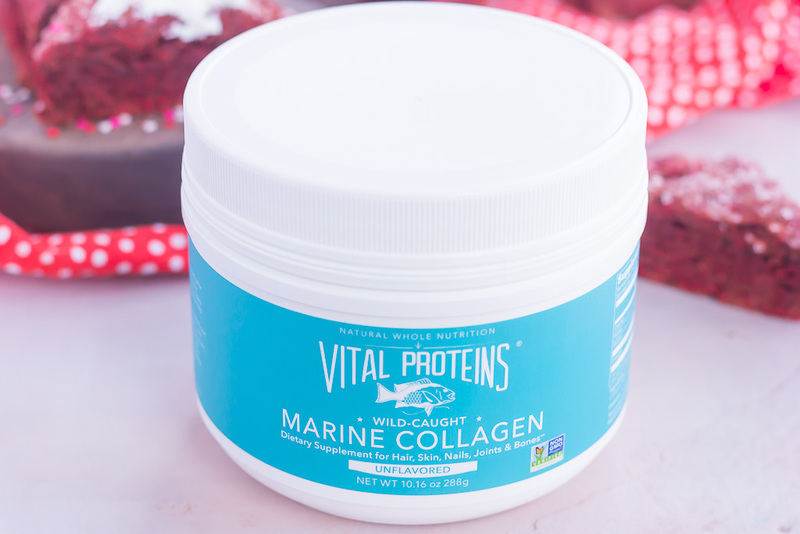 I recently bought the Vital Proteins® Marine Collagen Peptides and am hooked! Just like the regular version, it has many benefits. This kind of collagen peptide is made from the scales of fresh Non-GMO Project verified wild-caught snapper. It’s a great source of the amino acid proline and glycine, which helps promote healthy immune, digestive, and central nervous systems. It’s also bioavailable, which means it’s digested and absorbed by the body quickly for maximum benefits. 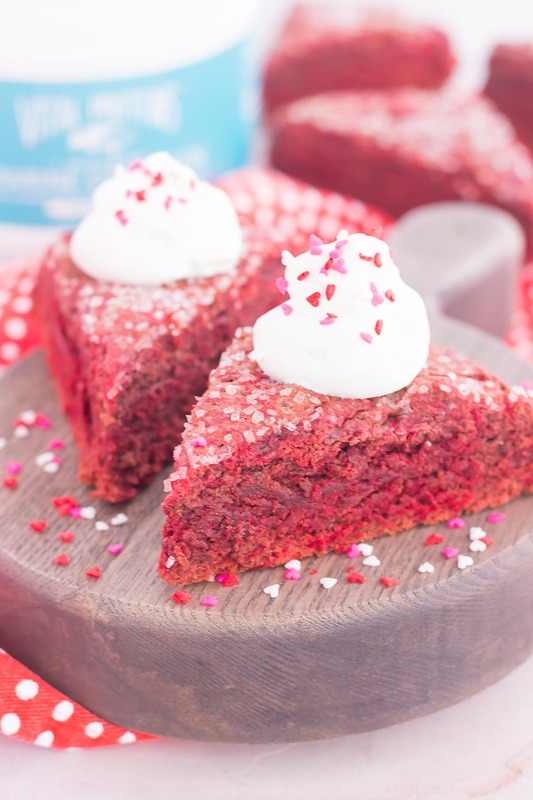 In addition to using the Vital Proteins® Marine Collagen Peptides in my morning coffee and smoothies, I added it to these Red Velvet Scones for an extra boost of collagen. Now let’s talk about the delicious taste and texture of these scones. Crispy and lightly flaky on the outside, while tender and moist on the inside is just the way I like my scones. 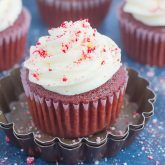 And that’s what you’ll find with these red velvet ones. I found this recipe in an older holiday magazine and adapted it slightly. I know I say this all the time, but these scones really are a breeze to make. The hardest part is waiting for them to come out of the oven! I chose to top these scones with some fresh vanilla whipped cream. It gives the chocolatey taste a light touch, without being too heavy. And, of course, some heart sprinkles, because it’s Valentine’s Day, friends! 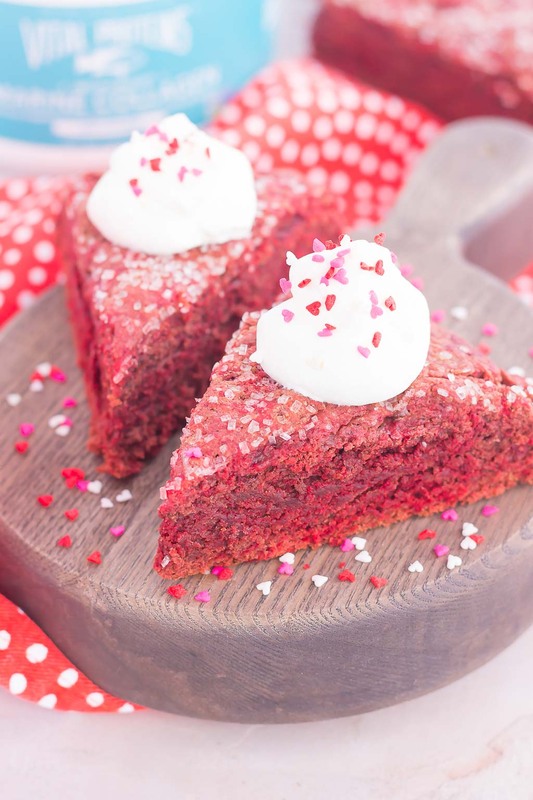 So if you’re looking for that perfect, last minute treat to whip up for your sweetie or gal pals, then these Red Velvet Scones were made for you! It serves as an indulgent breakfast or delicious dessert! 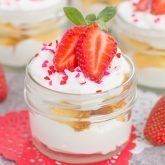 Looking for more Valentine’s Day recipes? I’ve got you covered! Preheat oven to 350F. Line a medium baking pan with parchment paper. Set aside. In a large bowl, whisk flour, sugar, cocoa powder, baking soda, salt, and Vital Proteins® Marine Collagen Peptides. Set aside. In a small bowl, add whipping cream, red food coloring, and vanilla extract. Stir to combine. Make a well in dry ingredients and pour in heavy cream mixture. Stir until just combined. If mixture is too dry, add 1/2-1 additional tablespoons of heavy cream. Turn dough out onto prepared pan and shape into a 7-inch disk. Cut dough into 8 wedges, but do not separate pieces. Sprinkle with course sugar. Bake for 20-24 minutes, or until a toothpick inserted into middle of scones comes out clean. Remove from oven and let cool on pan completely before cutting into wedges. To make whipped cream, in a large bowl, beat heavy whipping cream with an electric hand mixer until stiff peaks form. Add in powdered sugar and vanilla extract, beating until combined. Top cooled scones with vanilla whipped cream. Thanks, Blair! I'm a sucker for anything red velvet, too. Gayle, this is wonderful. It looks so good. I may have seen this late for Valentine's but I am preparing this on Saturday as I have some family visiting us. Thank you for sharing this recipe. Thanks for the sweet comment, Sheila! Hope you enjoy these! I hate seeing Valentine's Day stuff come out the day after Christmas. I get so irritated, especially since I want to think about healthy food only at that point in time! haha I love red velvet and these scones look PERFECT! They're such a pretty color red and they look so fluffy -- they're so pretty Gayle! Same here, Marcie! I don't need a candy overload right after the holiday treats. Thanks for the scone love! Thank you, Mira! Haha yes, now all of the Easter things are out in full force! I don't think Valentine's day stuff comes out that early around here, but it is not much long after. Love that you guys have such a cute way to celebrate Valentine's Day with the heart shaped pizza! 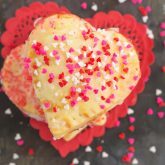 I mean, pizza on its own is pretty awesome, but heart shaped just adds to the cute factor ;) These scones look delicious, Gayle! Love that bright colour and the sprinkles on top. Even though Valentine's is over for the year, these would be welcome just about anytime! Pinned! Thanks for the scone love, Dawn! Hope you had a great Valentine's Day!